Box Office Warehouse Suites is completely built out of shipping containers. Flexible to meet the needs of small business owners. Lease office space that will grow with your business. Add on warehouse or workshop space by simply adding more shipping containers. 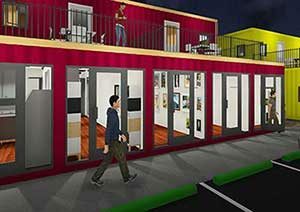 Containers are 8’ wide and 9’6” tall, with fully air-conditioned upper and lower office/Studio units. Retail lease space with all glass fronts adds visibility to showcase your products. Warehouse and shop areas have overhead doors. Affordable rates and flexible lease terms available. Located in the Alliance Corridor of North Ft. Worth. West of I-35 at the Golden Triangle exit.